Who are the Contracting Parties to the EEA Agreement? When did the EEA Agreement enter into force? What is not covered by the EEA Agreement? Who is responsible for the management of the EEA? What is the two-pillar structure? What are the EEA joint bodies, and what do they do? What are the institutional bodies on the EEA EFTA side, and what do they do? What is the role of the EFTA Secretariat? Which EU institutions take part in the management of the EEA Agreement? What is a “constitutional requirement” and what does it entail? In which EU groups and committees do the EEA EFTA States participate? What are EEA EFTA comments? Do the EEA EFTA States participate in EU programmes and agencies? The European Economic Area (EEA) brings together the EU Member States and three of the EFTA States (Iceland, Liechtenstein and Norway). It was established by the EEA Agreement, an international agreement which enables these three EFTA States to participate fully in the Single Market. It covers the four freedoms, i.e. the free movement of goods, capital, services and persons, plus competition and state aid rules and horizontal areas related to the four freedoms (see point 4 for an overview of what is included in the EEA Agreement). The objective of the EEA Agreement is to create a homogenous European Economic Area. All relevant EU legislation in the field of the Single Market is integrated into the EEA Agreement so that it applies throughout the whole of the EEA, ensuring uniform application of laws relating to the Single Market. 2. Who are the Contracting Parties to the EEA Agreement? The 28 EU Member States, together with the three EFTA States Iceland, Liechtenstein and Norway, make up the EEA Contracting Parties (the 31 EEA States). In everyday language the latter three go by the term “EEA EFTA States” in order to clarify that the other EFTA State, Switzerland, is not party to the EEA Agreement. However, in the EEA Agreement and legal texts linked to it (e.g. in Joint Committee Decisions (JCDs)) the term “EFTA States” refers to the three States and is also understood to exclude Switzerland. The EEA Agreement states that when a State becomes a member of the European Union, it shall also apply to become party to the EEA Agreement (Article 128 EEA), thus leading to an enlargement of the EEA. 3. When did the EEA Agreement enter into force? 4. What is included in the EEA Agreement? The EEA Agreement provides for the inclusion of EU legislation in all policy areas of the Single Market. This covers the four freedoms, i.e. the free movement of goods, services, persons and capital, as well as competition and state aid rules, but also the following horizontal policies: consumer protection, company law, environment, social policy, statistics. In addition, the EEA Agreement provides for cooperation in several flanking policies such as research and technological development, education, training and youth, employment, tourism, culture, civil protection, enterprise, entrepreneurship and small and medium-sized enterprises. The EEA Agreement guarantees equal rights and obligations within the Single Market for citizens and economic operators in the EEA. Through Article 6 of the EEA Agreement, the case law of the Court of Justice of the European Union is also of relevance to the EEA Agreement, as the provisions of the EEA Agreement shall be interpreted in conformity with the relevant rulings of the Court given prior to the date of signature (i.e. 2 May 1992). The EEA Agreement does not cover the following EU policies: common agriculture and fisheries policies (although the EEA Agreement contains provisions on trade in agricultural and fish products); customs union; common trade policy; common foreign and security policy; justice and home affairs (the EEA EFTA States are however part of the Schengen area); direct and indirect taxation; or economic and monetary union. 6. Who is responsible for the management of the EEA? The administration and management of the EEA is shared between the EU and the EEA EFTA States in a two-pillar structure (see diagram in point 7). Substantive decisions relating to the EEA Agreement and its operation are a joint venture and are taken by joint EEA bodies (see point 8) established by the EEA Agreement and consisting of representatives both from the EU side and the EEA EFTA States. The daily management of the EEA lies with the 30 individual states, which are responsible for implementing new legislation and adhering to the rights and obligations laid down by the EEA Agreement. To ensure uniform implementation and application of the common rules in all EEA States, there is a system of monitoring and judicial control, under which the EU institutions are responsible for the EU Member States and the EEA EFTA institutions (see point 9) are responsible for the EEA EFTA States. In addition, the EFTA Secretariat in Brussels plays an important role in the coordination and management of the EEA. 7. What is the two-pillar structure? EEA bodies are in the middle. The two-pillar structure covers firstly the decision-making procedure. In the EEA EFTA pillar all decisions are taken by consensus, as opposed to the EU pillar where decisions related to EEA legislation are normally taken by majority vote (see point 9 for the decision-making procedures of the EEA joint bodies). Secondly, the structure encompasses supervision and judicial control and, as parallels to the European Commission and the Court of Justice of the European Union, a surveillance authority and a court were established by the EEA Agreement to ensure the monitoring of implementation and application of EEA law in the EEA EFTA States. 8. What are the EEA joint bodies, and what do they do? The EEA Joint Committee (the EU side is represented by the European Commission (itself represented by the European External Action Service (EEAS) and its services), the three EEA EFTA States (usually at ambassadorial level) and an observer from the EFTA Surveillance Authority (ESA)) meets regularly and is responsible for the ongoing management of the EEA Agreement and for decisions concerning the incorporation of EU legislation into the EEA Agreement. Its decisions are taken by consensus. The EEA Council (members of the Council of the European Union and members of the European Commission (itself represented by the European External Action Service (EEAS) and its services), and Foreign Ministers of the EEA EFTA States) meets twice a year and provides political impetus for the development of the EEA Agreement and guidelines for the EEA Joint Committee. 9. What are the institutional bodies on the EEA EFTA side, and what do they do? The Standing Committee of the EFTA States (Ambassadors of Iceland, Liechtenstein and Norway, and observers from Switzerland and ESA) is a forum in which the EEA EFTA States consult each other and arrive at a common position before meeting with the EU in the EEA Joint Committee. The Committee has five subcommittees which consist of representatives of the foreign ministries or the Prime Minister’s Office of the EEA EFTA States. Under the subcommittees there are several working groups which consist of experts in different fields from the national administrations of the EEA EFTA States. They are responsible for processing all EU legislation to be incorporated into the EEA Agreement. EEA EFTA bodies involved in the management of the EEA Agreement. The EFTA Surveillance Authority (ESA), based in Brussels, ensures that the EEA EFTA States fulfil their obligations under the EEA Agreement. In addition to general surveillance of compliance, ESA has powers in relation to competition, state aid and public procurement, reflecting the extended competences of the European Commission in these fields within the EU. The EEA Agreement foresees close cooperation between ESA and the European Commission. 10. What is the role of the EFTA Secretariat? 11. Which EU institutions take part in the management of the EEA Agreement? The European Union Member State holding the Presidency of the Council of the EU participates in the EEA Council meetings and chairs the meeting once a year. It also holds the chair of the Council’s own Working Party on EFTA, which meets on a regular basis to discuss EEA EFTA relations. The European Commission is responsible for monitoring the EU Member States’ incorporation of and compliance with EEA law. When preparing legislation in areas covered by the EEA Agreement, it works with and takes into account the advice of EEA EFTA experts, and allows EEA EFTA participation in various expert groups and committees. It also plays an important role in deciding which EU acts are to be incorporated into the EEA Agreement and in drafting Joint Committee Decisions (JCDs). The European External Action Service coordinates and participates (together with the Commission and the Council) in the EU process of deciding which EU acts are to be incorporated into the EEA Agreement. It participates in the EEA Council and in the EEA Joint Committee. In the latter, it also holds the presidency in alternating periods of six months, i.e. January to June every year. 12. What is EEA legislation? The EEA Agreement is based on the primary legislation of the EU (Treaty of Rome) at the time of the EEA Agreement’s entry into force, and on secondary legislation (EEA-relevant regulations, directives, decisions and certain non-binding instruments). Hence, a large part of the EEA Agreement is identical to the relevant parts governing the four freedoms as laid down in the Treaty on the Functioning of the European Union. A central feature of the EEA Agreement is its dynamic aspect; the common rules of the EEA Agreement are updated continuously with new EU legislation. The legal texts of EEA Agreement consist of 129 articles, 22 annexes, 49 protocols and a final act. The annexes list the EU acts applicable to the EEA, including adaptations. Some of the protocols include provisions on specific areas such as rules on the origin of goods, transition periods for the EEA EFTA States in certain fields and simplified customs procedures. Protocol 1 contains horizontal adaptations, which apply to all acts referred to in the annexes to the EEA Agreement. Protocol 31 provides the basis for cooperation outside the four freedoms, and on that basis the EEA EFTA States contribute financially to and participate in various EU programmes. Finally, on the basis of Protocol 35, the EEA EFTA States have undertaken to introduce in their national legal order, if necessary, a statutory provision to the effect that EEA rules prevail in the case of a conflict with other statutory provisions. 13. How is new EU legislation incorporated into the EEA Agreement? After an EU act has been adopted, the EFTA experts in the EEA EFTA States analyse whether the act is EEA relevant and, if so, whether any adaptations are required in the JCD for incorporation into the EEA Agreement and whether there are likely to be any constitutional requirements (see point 14 for more on constitutional requirements). An act is considered EEA relevant when its content concerns an area covered by the EEA Agreement. Once the EFTA Secretariat has received feedback from all three EEA EFTA States concerning these issues, it drafts a JCD. When the draft JCD has been cleared both by the EFTA experts and by the relevant subcommittee, it is handed over to the EEAS, which initiates an inter-service consultation in the Commission. Once the Commission has agreed on the draft JCD, it is sent to the Council of the European Union for adoption if it contains substantial adaptations, otherwise the EU’s position is adopted by the Commission. The EFTA Secretariat and the EEAS then consult on the timing of adoption in the EEA Joint Committee, and when all Contracting Parties are in agreement the EEA Joint Committee adopts the JCD. See also Council Regulation (EC) No 2894/94 concerning arrangements for implementing the Agreement on the European Economic Area. 14. What is a “constitutional requirement” and what does it entail? The need for parliamentary approval can affect the date of entry into force of the JCD, but the EEA EFTA States have introduced procedures to inform and consult with their parliaments at an early stage. When the constitutional requirements have been fulfilled in an EEA EFTA State, the EEA EFTA State notifies the EFTA Secretariat, which forwards this information to the EEAS and the other EEA EFTA States. Once the last EEA EFTA State to have constitutional requirements has notified the EFTA Secretariat that all constitutional requirements have been fulfilled, the JCD can enter into force according to its wording. A list of awaited notifications is available on EFTA's website. 15. What is “decision shaping”? - First, representatives of the EEA EFTA States have the right to participate in expert groups and committees of the European Commission. They participate extensively in the preparatory work of the Commission and should be consulted in the same manner as EU experts. The Commission may seek advice from the EEA EFTA experts by phone or by correspondence, or in meetings. The experts may also be associated with the preparatory work through regular committee meetings. - Second, the EEA EFTA States have the right to submit EEA EFTA comments on upcoming legislation (see point 18). While the EEA EFTA States use these opportunities to contribute to the legislative process, they can neither sit nor vote in the European Parliament or the European Council. More information on this subject may be found in the EFTA Bulletin (2009) on Decision Shaping in the European Economic Area. 16. In which EU groups and committees do the EEA EFTA States participate? The EEA EFTA States have access to the following types of Commission committees: expert groups (Article 99 EEA); comitology committees (Article 100 EEA); programme committees (Article 81 EEA); and other committees in specific areas (Article 101 EEA). 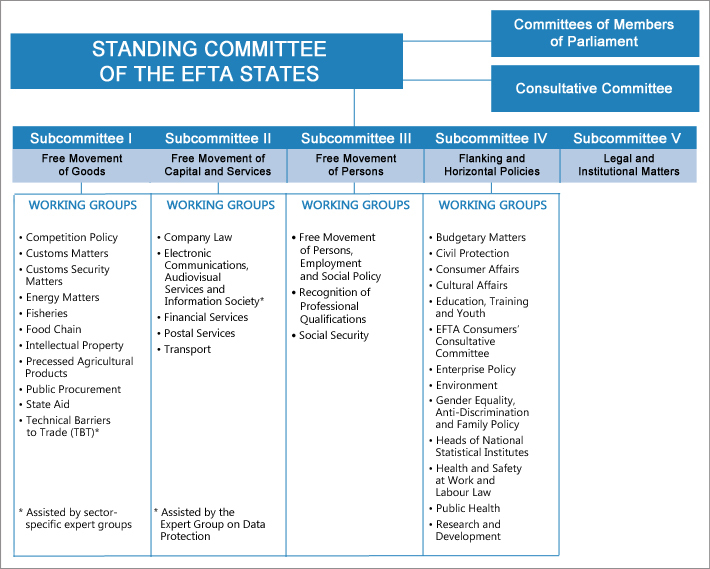 In total, the EEA EFTA States have the right to participate in several hundred committees. 17. What are EEA EFTA comments? One of the ways in which the EEA EFTA States participate in shaping EU legislation is by submitting comments on important policy issues. A typical EEA EFTA comment provides a brief commentary and suggestions regarding Commission initiatives such as green papers or legislative proposals. The comments are endorsed by the Standing Committee and officially noted by the EEA Joint Committee after they have been sent to the relevant services in the Commission, the European Parliament and/or the Council. EEA EFTA comments are available here. 18. Do the EEA EFTA States participate in EU programmes and agencies? The EEA Agreement ensures participation by the three EEA EFTA States in a number of EU programmes and agencies. Several others are under consideration or preparation for incorporation into the EEA Agreement. In addition, bilateral agreements with the EU ensure the participation by the individual EFTA States in several other EU agencies. The EFTA website provides a list of all EU programmes and a list of all EU agencies in which the EEA EFTA States currently participate. 19. Where can I find EEA Joint Committee Decisions and EEA legal texts and documents? EEA Joint Committee Decisions are published in the Official Journal of the European Union in all EU languages, and in the EEA Supplement to the Official Journal in Norwegian and Icelandic. Adopted Joint Committee Decisions (JCDs) are also listed and published on the EFTA website. In addition, the website provides an overview of and contains links to legal texts and documents connected to the EEA Agreement, including but not limited to: the main Agreement, as well as its annexes and protocols; a list of JCDs; adopted decisions of the EEA Council; a list of adopted EU acquis identified as EEA relevant by the EU or the EEA EFTA States, and a list of EU acquis that has been marked as EEA relevant by the EU but later excluded as such by one or more of the EEA EFTA States; and a list of earlier decisions where there were constitutional requirements. The EFTA website also holds a public register, through which a large number of documents are made available. 20. What are the EEA Grants? The EEA Grants are related to the EEA Agreement and provide social and economic development funding from the EEA EFTA States. This financial support aims at reducing economic and social disparities in the EEA and strengthening bilateral relations with the beneficiary states: Bulgaria, Cyprus, Czech Republic, Estonia, Greece, Hungary, Latvia, Lithuania, Malta, Poland, Portugal, Romania, Slovakia, Slovenia and Spain. In addition to the EEA Grants, Norway has funded a parallel scheme since 2004 – the Norway Grants. For further reading, visit www.eeagrants.org.